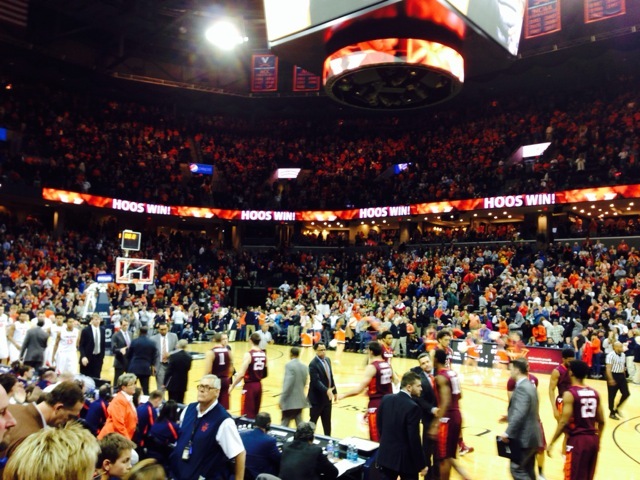 Hoo Crew, the 2014 Naismath Student Section of the year, shares their vantage point of their final home game of the 2014-15 season, against rival Virginia Tech. Here's a recap of their day. You can follow them on Fancred here. Students lined up before the game. It was cold. "Under 20 minutes until gates open and we've got lots of students out here!" Seats in the sideline filled up in less than 10 minutes. Hoo Crew's fathead game is strong. Hoo Crew's trolling game is also very strong. Here's a throwback to last year's game against Tech. This was the last home game for UVA seniors. It's getting dusty in here. "It's Senior Day here. Thank you to Darion Atkins for all of your work and dedication. We will miss you!" "Thank you to all our amazing senior players and managers!" The man himself, Tony Bennett, makes his entrance. "And boom goes the dynamite." Follow Hoo Crew on Fancred here.